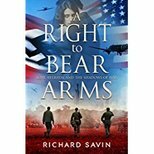 I love modern history, am a fan of political thrillers and just love a good ‘Boys-own’ yarn, so it’s no surprise that I’m choosing ‘A Right to Bear Arms’ as my Best Book of 2017. It’s really two stories smoothly integrated into one. The first one is a counter-factual history of the Second World War; the second the tale of a ‘band of brothers’ caught up in the events that follow. Counter-factual history takes a key event in the past, turns it on its head and explores the consequences. In this case, instead of the bitter solo resistance of the UK against Hitler, the author postulates that the British government signs a Vichy-like treaty after Dunkirk and the fall of France. It’s very hard to bring this off, especially in a novel. Readers are ready to suspend belief for imaginary events, but here we are asked to believe in something that we well know never happened. Richard Savin deserves an accolade for giving us such a convincing account of what is blatantly false. He offers us detailed biographical information and character analyses of the major historical players, and takes us through their discussions and planning in a logical manner. We accept that it was only a stroke of luck that prevented such a treaty being agreed, and that the consequences of that treaty would have been exactly as he describes them. I found this aspect of the book fascinating and faultless. I have only one small criticism of the other aspect of the book: the story of the fictitious ordinary people affected by the resulting intrigue and conflict. The author resorts to the same detail and diligence in passing on their back stories and I personally found it slowed up the action at the start of the story. However, once the characters were established, the pace racked up and it was a page turning read right to the end. A good one!